Elegant, stylish and well-preserved, this Vacheron Constantin reference 4072 is incredibly impressive. In production from 1938 until the late 1960s, the reference 4072 is a very diverse chronograph model. While cased most often in yellow gold, the reference was also dressed in pink gold, stainless steel, or steel and gold combinations. 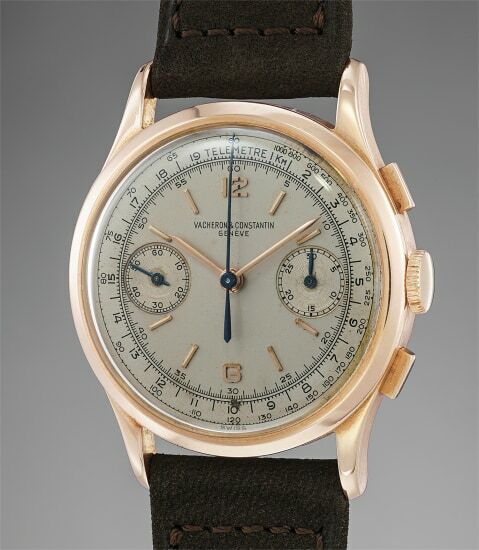 Very few pink gold timepieces with the chronograph caliber 492 were ever manufactured, making this timepiece incredibly rare. Of particular note is the crisp case, displaying a strong hallmark beneath the elongated lugs. Furthermore, the case retains all its crisp facets, along with contrasting polished and satin finishes. The dial too, is preserved in excellent condition, with clear and legible printed graphics.